Imagine you turn on your TV, and it tells you exactly what’s happening on each channel. We’re not just talking show names and schedule grids, but live updates down to the topic that’s being discussed on each and every network, be it Malaysia Airlines flight MH370, March Madness or Crimea. Palo Alto-based TV data startup Boxfish has built such a TV experience, and is now working to bring it to your cable box. 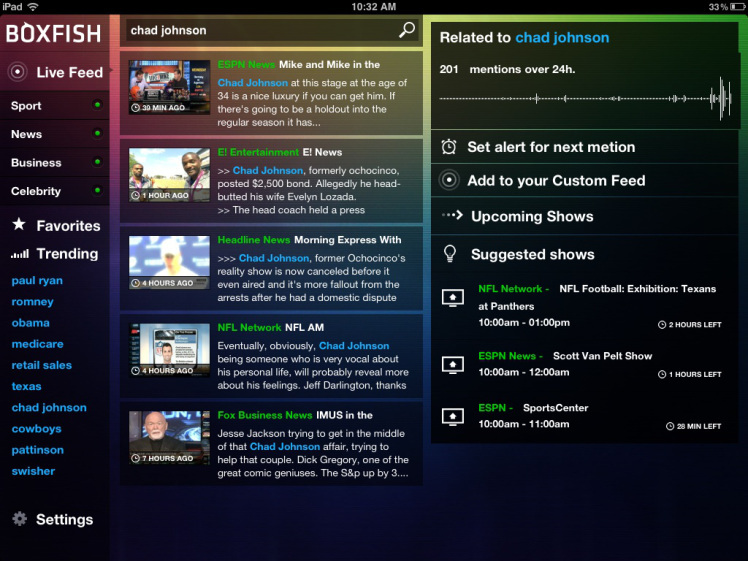 A prototype of a TV guide that shows viewers topics in real time, built by Boxfish. Boxfish has been working on its vision of a smarter TV experience since 2010, and on Monday, the company is set to announce that it just secured a $7 million Series B round of funding led by Atlantic Bridge, and including a strategic investment from Samsung. Existing investors T-Ventures and Naya Ventures also participated, bringing the total amount raised by Boxfish to more than $10 million. Boxfish’s first product was a second-screen app that tried to reinvent the TV guide with real-time data. To do so, the company started to analyze every word said on any of the big broadcast stations and cable networks around the country in real-time. Boxfish then identified popular topics and surfaced these through the app, making it possible to find any station that was talking about a certain sports team or specific news event at any given time. The result was a dream come true for news junkies — but also a somewhat messy and quickly overwhelming TV guide experience. To make matters worse, there wasn’t any real integration with the first screen – so you could find a station that was talking about a certain subject — but by the time you had switched that station with your TV remote, the conversation could have already shifted. Boxfish’s second-screen app, which is still available for Android and iOS, is great for news junkies — but also quickly overwhelming. “The biggest use case for our technology is to be on the first screen,” said Boxfish CEO Eoin Dowling when I visited the company’s office in Palo Alto last week. Not only is the direct integration with TVs and set-top boxes a lot more user-friendly, it also makes a lot more sense from a business perspective. Second screen companies have faltered by the dozen in recent months, but Boxfish early on focused on building out an API, and the company has been able to win consumer electronics manufacturers, TV service operators and others as customers. “We survived long enough to monetize it,” said Dowling. Today, Boxfish analyzes every word spoken on 1000 TV channels in real-time. The company makes sense of all this data by clustering it and analyzing it based on the context in which it is spoken to identify topics and then figure out which of these topics are trending across TV networks. The topical, real-time TV guide is one application for all this data, but cable companies could also use it to build a better DVR that not only records shows, but also tags each and every recording with metadata. That way, you’d be able to record an episode of SportsCenter, and immediately jump to the segment that features your favorite team upon playback. “We want to be that layer of data that makes TV relevant to people,” Dowling said. Smasung’s contextual smart TV, as shown at CES 2014. Dowling told me that over 100 companies already use Boxfish’s API. In some cases, TV service operators are starting to roll out limited tests of services powered by Boxfish data. Dowling couldn’t tell me who exactly is doing these tests, but he did confirm that Samsung is using Boxfish to power some of the contextual features in its latest smart TVs. Samsung’s newest TVs, which the consumer electronics giant showed off at CES in January, are capable of automatically searching for YouTube(S GOOG) clips relevant to the content you’re watching on TV. Boxfish is now looking to spend some of its new money on hiring additional talent, and provide its data services beyond the U.S. TV market. The company recently opened up an office in Dublin and has already started to index British TV data. Dowling said that Ireland, Australia and Canada would be natural next steps, but he also predicted that the majority of the company’s business would come from the U.S. for the foreseeable future. So when are cable boxes going to become smarter, thanks to Boxfish data? 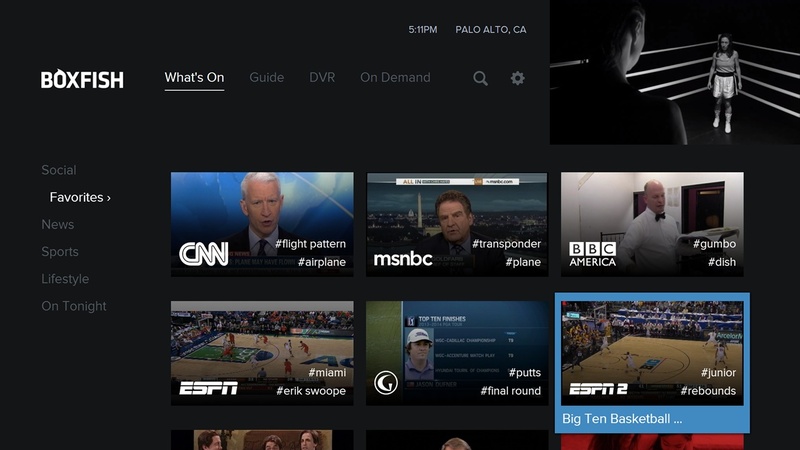 Dowling said that some of the contextual features that Boxfish is enabling, including the ability to browse TV by topics, could come to some TV viewers before the end of this year. 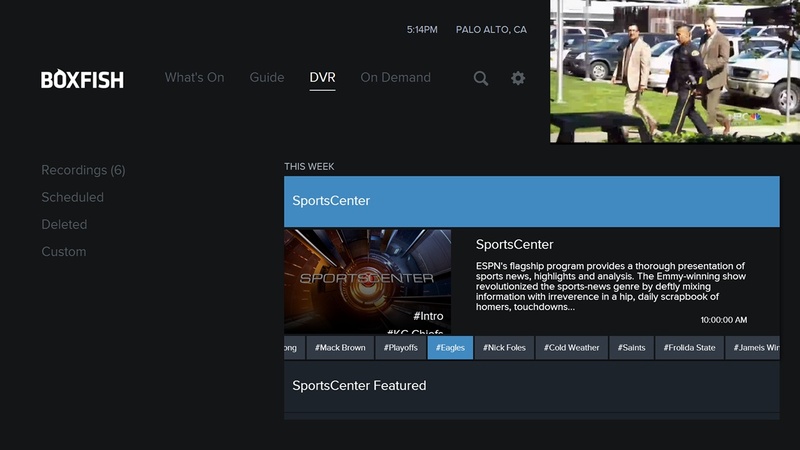 A DVR that indexes show segments by topic – and potentially also serves up ads based on the topics you like or skip. Until now, the idea has been to profile viewers based on where they live and which shows they watch — but Boxfish could make these profiles a lot more granular by allowing companies to keep track of the segments a viewer skips and the topics he or she is interested in, thereby allowing networks to charge more for ads that for once are more hit than miss. In other words: The cable box of the future may not only be a lot smarter than today’s model, but potentially also a lot more lucrative for networks and operators.